Ever wondered what the secret is to making crunchy, crispy sweet potato fries at home? Well, we’ve discovered the trick (and it doesn’t involve a deep-fryer!). This is the simple, no-fail secret to baking perfectly crispy sweet potato fries with an audible crunch. Yes – they’re that crunchy! To knock up this simple recipe, you won’t need any new or fancy equipment, or any fancy ingredients for that matter. There’s no fancy batter involved either, so these fries stay 100% paleo, gluten and dairy free. We hope you enjoy this recipe, and that your oven-fries game is forever changed! DOWNLOAD THIS RECIPE TO ADD TO YOUR COLLECTION! Peel your sweet potato and cut into fries – whatever shape you prefer! They don’t have to be very thin-cut to get crisp, but we recommend going 1cm or under for a super crispy result! But then again…thicker fries have a more caramelised centre (yum!!) so…we’ll leave that decision up to you! Put the sweet potato fries into a large bowl and coat them with the melted coconut oil. Once they are well coated, add the tapioca, salt and pepper and toss / stir through. The sweet potato fries don’t have to be completely coated in the tapioca – so don’t worry if it’s not perfect. For extra sweetness, we also like to add a teaspoon of cinnamon. Lay out your fries on the baking tray and pop into the oven. It’s good to give the fries as much space as possible, however crowding isn’t a dealbreaker either. You can see below how much space we had between each fry – this is ideal, however we’ve also made great crispy fries with less spacing! Bake for 30 – 40 minutes, or until golden. The cook time will depend on the thickness and amount of fries, so it’s best to just keep an eye on them. Extra tip: Fries can cook soggy if there’s too much steam in the oven. Prevent this by letting out the steam half way through, by simply opening the oven for a few seconds! Once cooked, leave your fries to cool for a few minutes before serving. Keep in mind that putting your fries straight into a bowl can cause them to steam up and loose some of their crispiness, so do let them air for a moment! 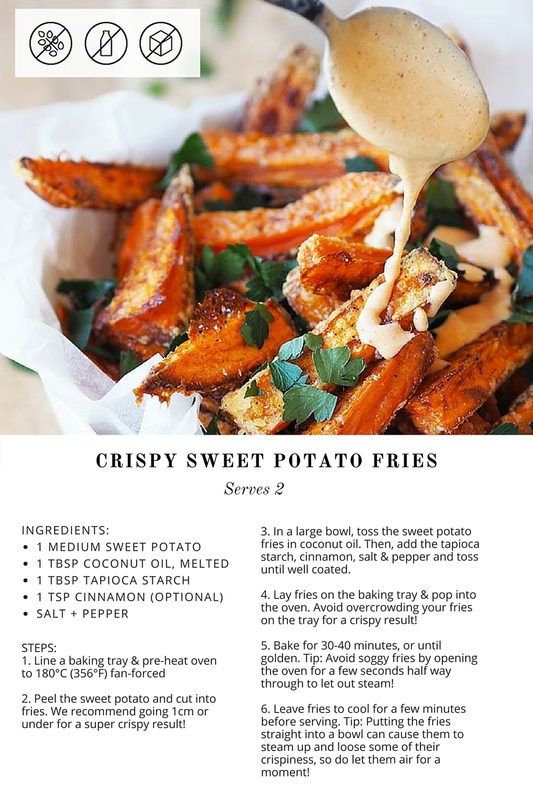 Enjoy your sweet potato fries – and do let us know if you tried this recipe!